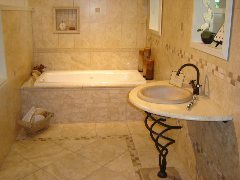 We professionally clean and restore all types of ceramic tile grouting surfaces including floors, counter tops, vinyl floors and showers/bathroom surfaces. Our powerful truck mounted steam cleaning machine system will emulsify and extract years of dirt, grease, grime and contaminates from your tile and grout. We provide FREE estimates and we explain the various cleaning, sealing and restoration options available for your particular surfaces.